Holiday season is upon us; the kids break up from school soon and I know many of you have holidays booked for during/after the summer break. As much as we love the ‘going on holiday’ part, most of us hate packing. I have a secret though: I love packing! I find it exciting as it really gets me in the holiday mood as I blast out some music! I am an avid list maker in life generally but especially when it is holiday time. Write down a few headers: clothes, toiletries, make-up, electronic and miscellaneous and list items underneath their headers. 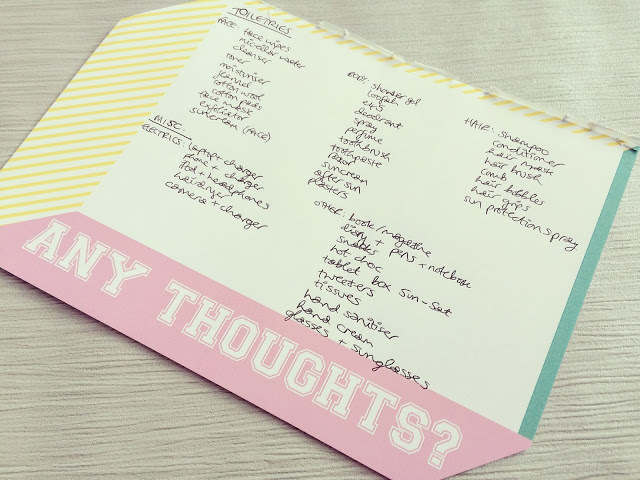 This will vary from person to person but if you’re really stuck, have a look online or on Pinterest where you will find tonnes of blogs and images about packing! 2. Lay everything you plan to take on your bed/on the floor. Gather items one by one so you can see what you’re taking. Try to group your items together by header so you can see what items you have. Highlight/tick off when you have placed the item on the floor/bed. 3. Take some items away. This will apply for most of you: you do not need to take that much stuff with you! For me, my specific skincare is always a must because of my sensitive skin but I always take too many books with me. Whether it’s lipsticks or socks, make sure you’re only taking what you need. Whether you’re staying in the UK or going abroad, I’m sure you will have a shop nearby where you can buy essentials from like spare vest tops or a towel. 4. Decide on your travel outfit. I always like to travel in my bulkiest items. This for me is a pair of jeans, a hoodie, possibly boots or trainers, depending on what time of year it is. This will save so much room in your case, trust me! Wear as many layers as you can bear as they can always be taken off! 5. Set aside items for hand luggage. First, check what you can and can’t take with your airline! 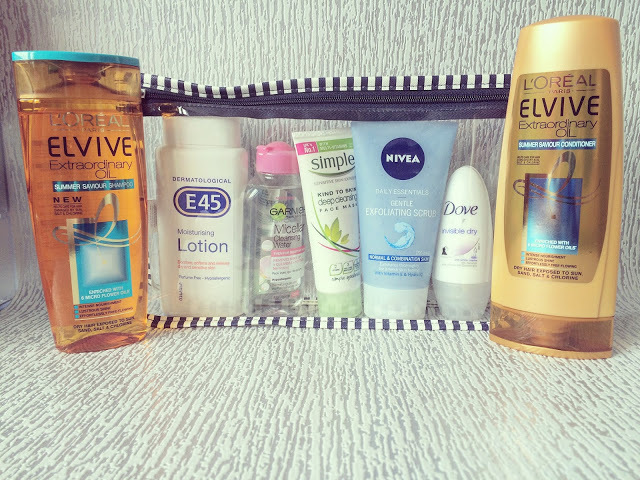 I would recommend avoiding taking most toiletries in your carry-on as you’ll end up having to dispose of it! If you’re travelling by car, this doesn’t really apply but still try to put your heaviest items in your case. Also, make sure you have something with you to occupy yourself on a long journey: snacks, water, a book/magazine, iPod. 6. Pack like a pro. First of all, put your shoes into your suitcase. Heavier items should always go at the bottom so shoes and some electrical items, such as hairdryers, should go nearer to the bottom. Next, make sure all toiletries are well packed and won’t leak and place those in next. Thirdly, place in your heavier clothing items such as jeans or jumpers before placing vest tops in. Try layering in a few coathangers if you can because you never seem to get enough coathangers in hotels! Finally place those delicate items at the top such as make-up (in its bag) and creasable clothing items. Socks and underwear can be slotted in to cushion items and save space. 7. Double check your list. Make sure every item on your list has a tick next to it/is crossed out. You can guarantee that you will have missed something (toothbrush, phone charger). Most of the time, these items can be shoved in your carry-on but if not, you should have some room in your case! If not, you’re probably taking too much! I think I’ve covered most bases but leave me a comment below if you have any more top tips!